Since my garden is in full bloom, I can watch many butterflies everyday. They dance from flower to flower in the sunlight. 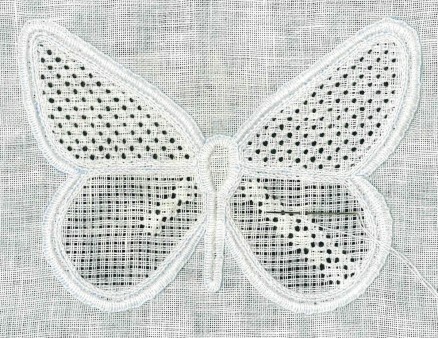 So, for July I decided to feature the butterfly. 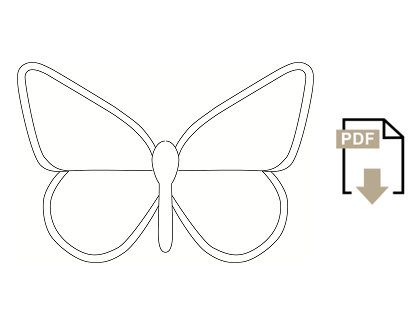 There are so many different butterfly shapes – I have chosen a very simple one. 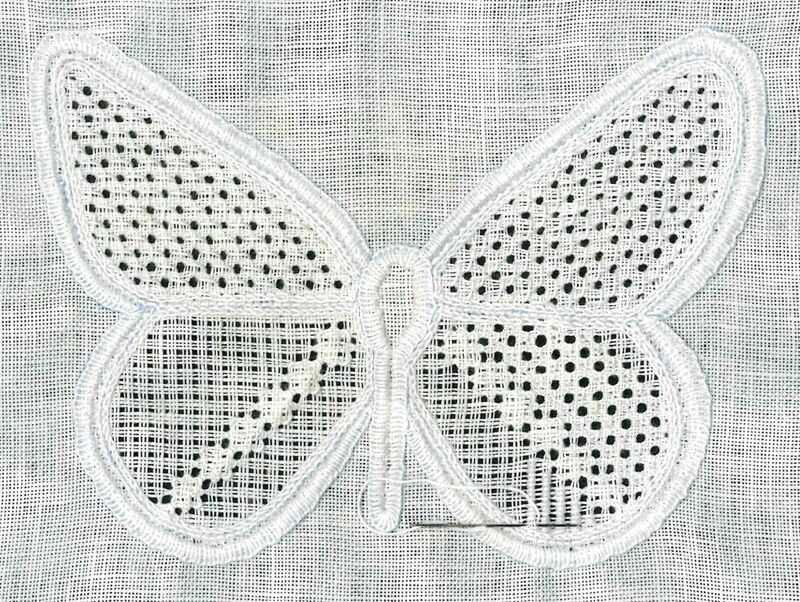 My shape measures 16 cm in the width and 11 cm in the height, but one could use a smaller shape if the linen has a higher thread count. 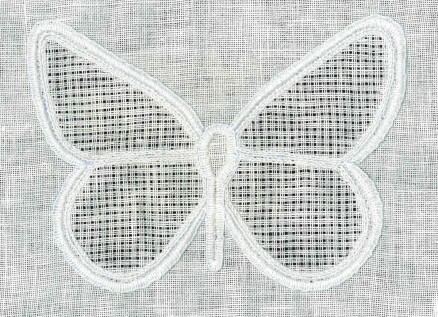 The vertical and the horizontal axes are marked on the linen so that the design outline can be transferred precisely. Using Coton à broder No. 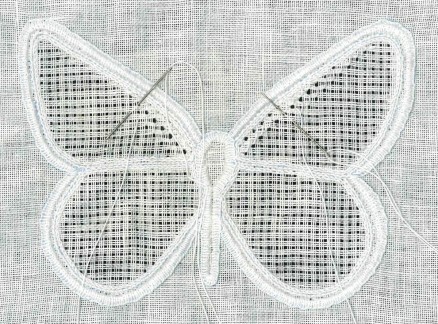 16, on Weddigen linen, 13.5/cm thread count, Coral Knot stitches are worked along the inner lines of the wings. Using Coton à broder No. 25 Chain stitches are worked a small distance outside the Coral Knot stitches along the outside edges of the wings. 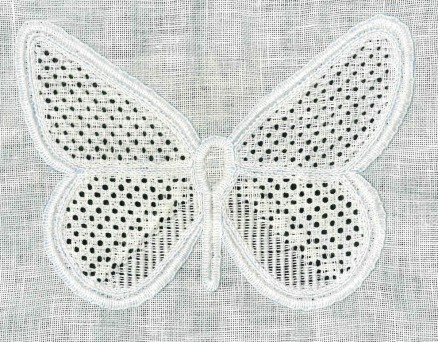 And Chain stitches are also worked just inside the outline of the body. 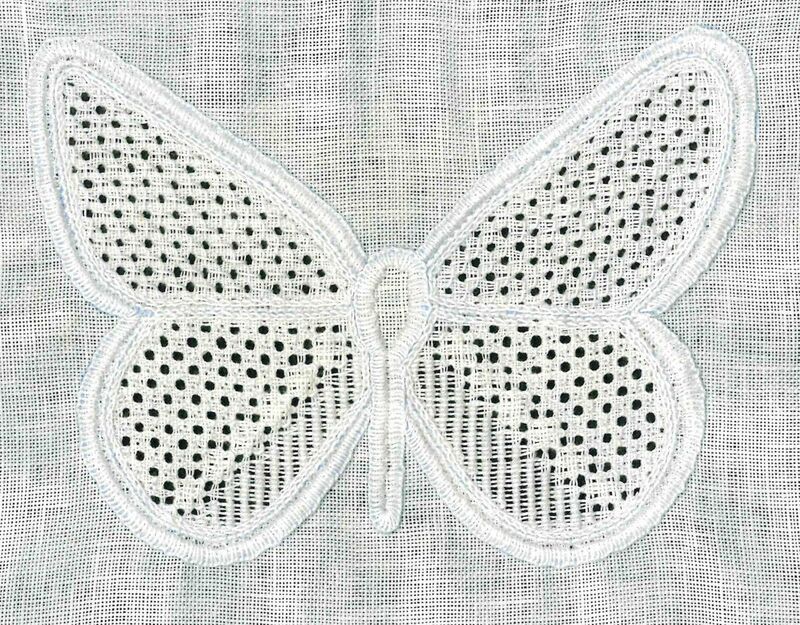 The Chain stitches are covered with densely worked Blanket stitches along the outside edges of the wings, and around the body using Coton à broder No. 20. 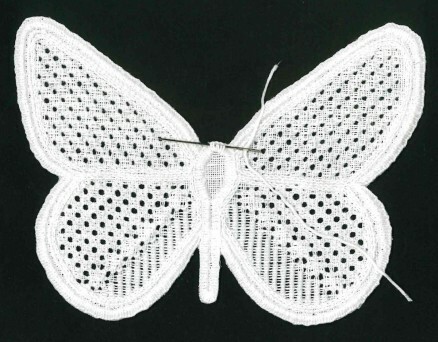 Chain stitches are worked along the inner areas of the wings using Coton à broder No. 25. A grid is made by cutting 1, leaving 3. Please proceed carefully: both the horizontally and the vertically withdrawn thread lines should match in the adjacent and mirrored areas. Using Coton à broder No. 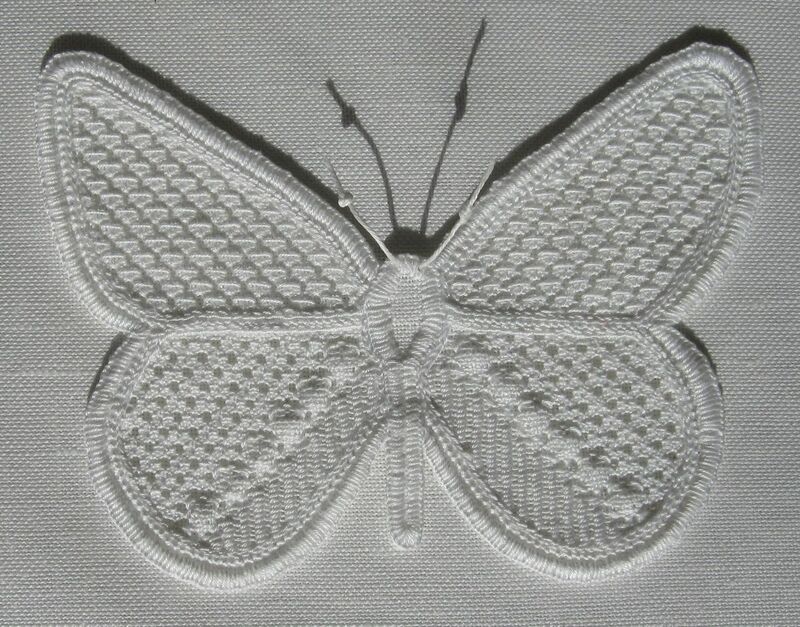 20 Diagonal Cross stitch (Basic Principles of Schwalm Whitework, pages 39 – 40) is worked mirrored in the top part of the wings. 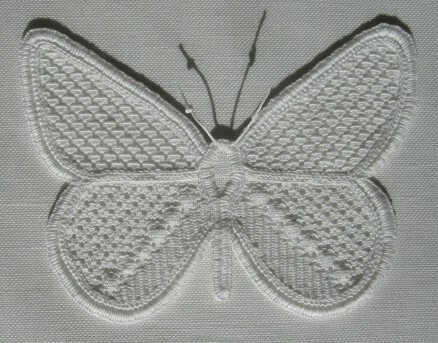 Using Coton à broder No.20 a variation of the “Röserich” is worked diagonally in the bottom part of the wings. 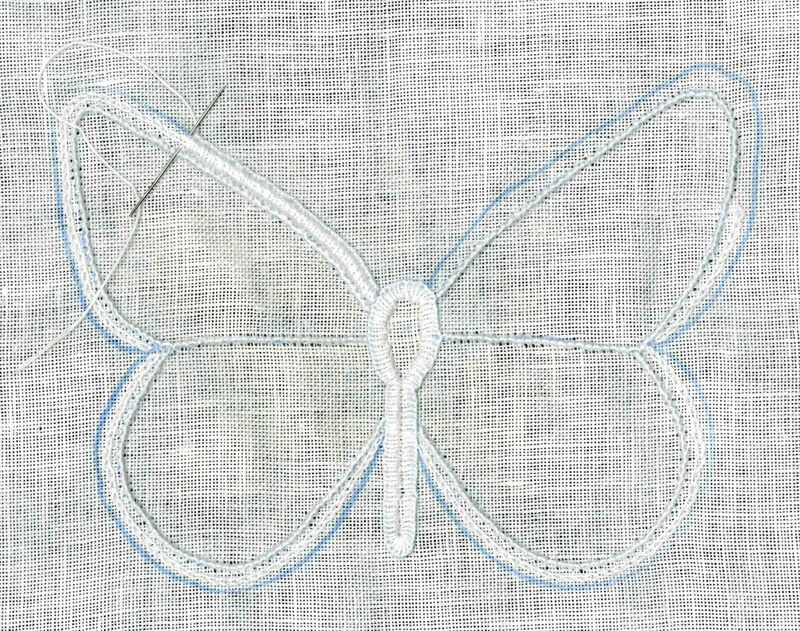 The areas remaining outside the “Röserich” (the upper part of the lower wing sections) are filled with Rose stitches using Coton à broder No. 25. Soon, a downloadable booklet will be available showing one of the most prominent filling patterns of Schwalm – the “Röserich”. 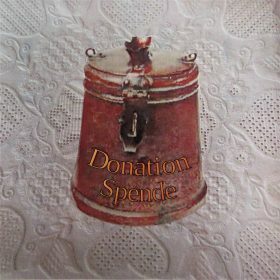 I found so many beautiful and , until now, undocumented variations, that I decided to publish a booklet with a description in great detail and illustrated with step-by-step instructions. 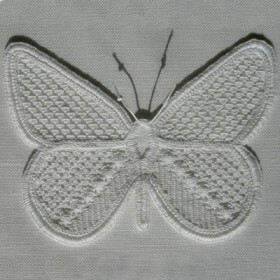 The inside remaining areas are filled with Satin stitches using Coton à broder No. 20. 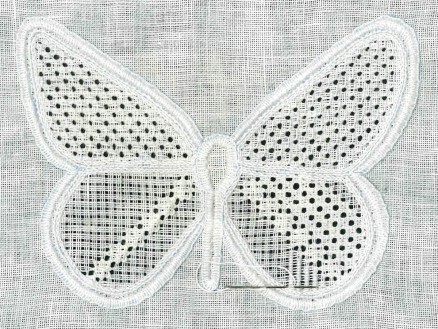 After finishing, the embroidered piece is washed (boiled), starched and ironed. 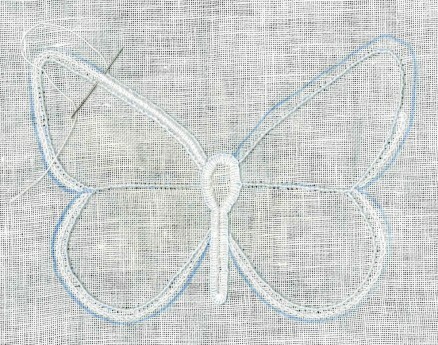 Then, the butterfly is cut. 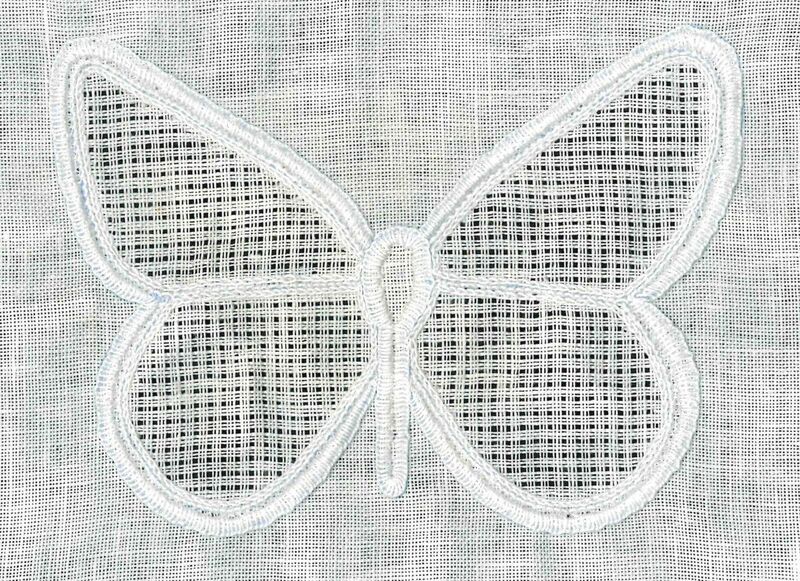 If needed, such closely trimmed embroidery can be washed and ironed – quick and easy – at any time, but never spun in a washing machine! 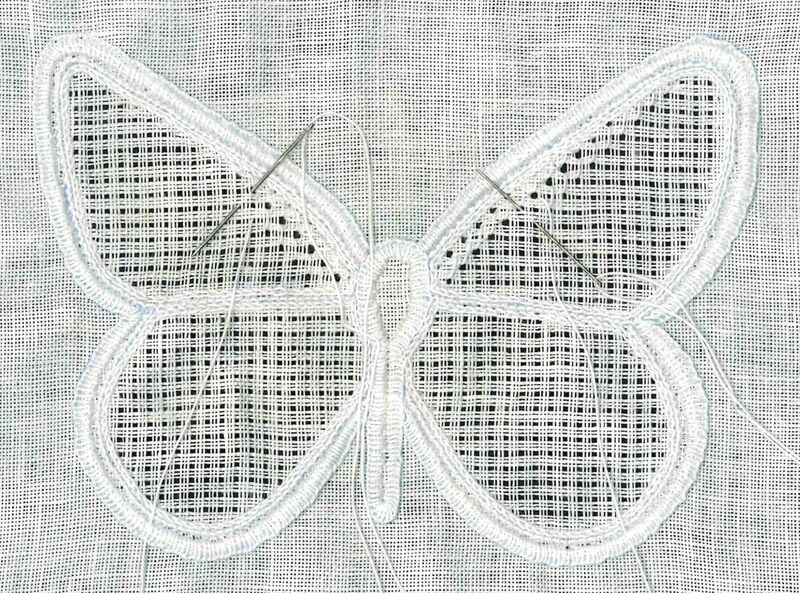 For the antennae, a thicker cotton thread is passed through some Blanket stitches of the head, cut to the right length, knotted at the ends and covered with starch (or hair gel) to achieve the right form. 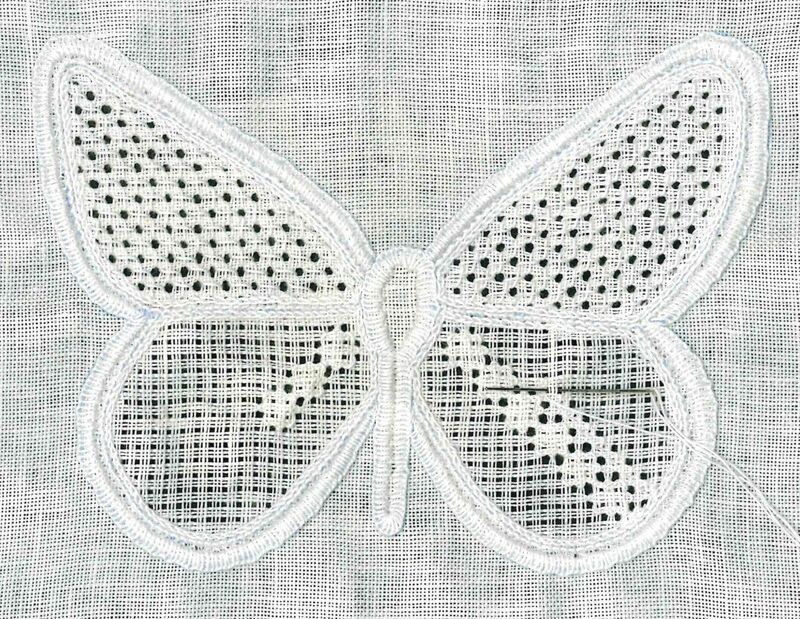 Doesn’t the butterfly look as though it will fly away any moment?